Ideal for small and mid-sized businesses, an IPNetVoice Hosted Unified Communications (UC) Solution is cloud-based and will provide you the most cost efficient communications network. Whether you have one location, or many throughout the USA and Canada, you will eliminate the hassle of managing your own complex phone systems and dealing with multiple providers to incorporate a full suite of features throughout your network. It is easy to switch over, and you keep your existing telephone numbers. Using Cisco technology and highly trained IPNetVoice engineers, you will have superior quality and service from day one. IPNetVoice maintains redundant data centers with multiple internet backbone providers to guarantee quality and continuity of Service. 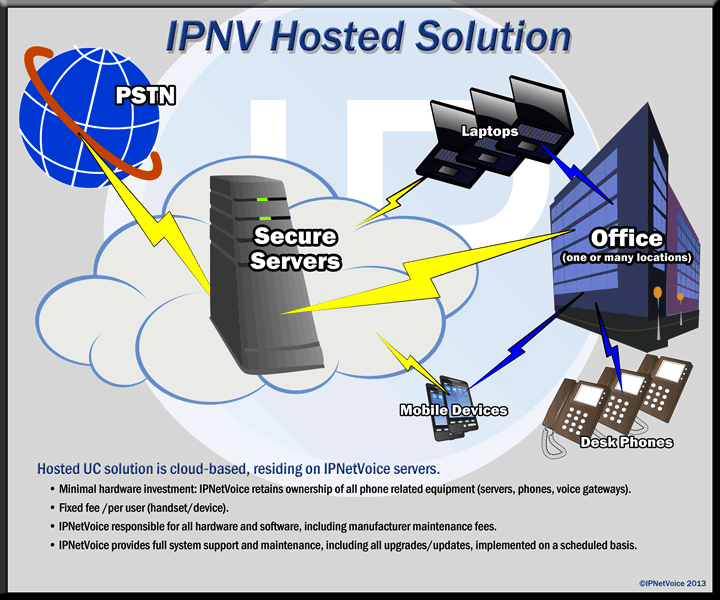 IPNetVoice Hosted UC system provides you with Enterprise-class features, at an S/MB budget. No longer will you need to purchase, manage & maintain phones and related equipment, IPNetVoice does all of this for you. If you are in the office or on the road, you remain connected with: smart phones, tablets and laptops all integrated. Featured benefits of an IPNetVoice Hosted Solution!